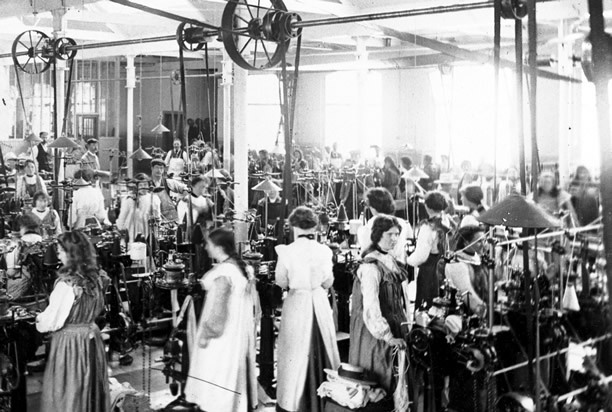 The first women’s trade union in New Zealand emerged in the late 19th century in response to the poor working conditions in the clothing industry. Tailoresses were not the only wage-earning women experiencing hardship in their occupations, but they were by far the largest group. Despite the introduction of the Employment of Females Act 1873, an early attempt to protect women workers, an increasing number of tailoresses, particularly young single women, began to call for fairer treatment and regular inspections of conditions in the clothing trade. What was known as the ‘sweating system’ attracted the interest of politicians, the public and the press. Presbyterian minister Rutherford Waddell highlighted the existence of sweated labour in Dunedin in his sermons in 1888, and the Otago Daily Times conducted an investigation into sweating in local clothing factories. Differences in opinion about working conditions for tailoresses led to a ‘large and enthusiastic’ meeting, held in Dunedin on 7 June 1889. While proposals to set a minimum standard of wages were denied by warehousemen, the meeting resolved to form the first tailoresses’ union of New Zealand – the Dunedin Tailoresses' Union (DTU). Established on 12 July, it became one of New Zealand’s most successful women’s unions, ultimately boasting a membership of up to 1400. The union lasted until 1945. Its achievements included increased wages and reduced hours for tailoresses; the appointment of female factory inspectors by the Department of Labour; support of other provincial and federal tailoresses unions; and close scrutiny of legislation that would impact women workers. Many of the members of the DTU were also leading figures in the campaign for women’s suffrage. The women’s suffrage petition of 1891 received 4000 signatures from Dunedin, and two-thirds of those were from working women. The numbers are largely accredited to the efforts of the DTU in raising the political awareness and determination of Dunedin's clothing workers. We have 16 biographies, 7 articles, related to First women's trade union formed.